Indian businesses have made $11 billion worth of investments in the U.S. as of 2013 and are our fourth-fastest growing source of FDI. As of 2012, Indian firms employed more than 43,000 American workers and exported more than $2 billion worth of goods from the United States. To further discuss bilateral commercial opportunities, Secretary Pritzker met with several senior Indian officials including Chief Economic Advisor Dr. Arvind Subramanian, with whom she discussed specific areas of opportunity for U.S. firms based on India’s needs such as infrastructure and smart city development. Secretary Pritzker then met with Minister of Urban Development Muppavarapu Venkaiah Naidu to highlight Commerce’s role in facilitating U.S. public and private sector engagement in India’s smart city development. Secretary Pritzker’s final bilateral meeting was with her counterpart, Minister of State for Commerce and Industry Nirmala Sitharaman. Their conversation focused on how to accelerate and deepen U.S.-India commercial ties, building upon their last encounter in July 2014 when Secretary Pritzker was in India for the U.S.-India Strategic Dialogue. To conclude her trip, Secretary Pritzker connected with more than thirty Commercial Service officers based in New Delhi. 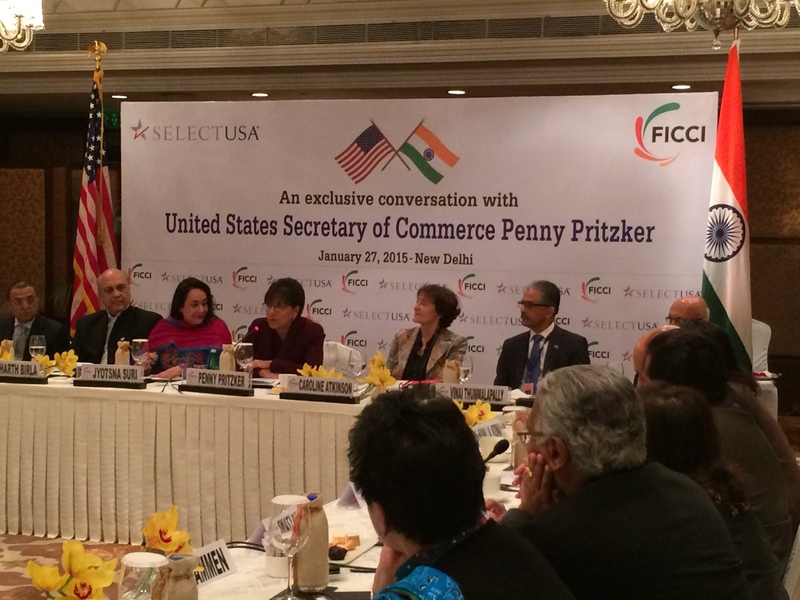 The Department of Commerce has seven Commercial Service offices with a team of 70 staff across India, and Secretary Pritzker thanked them for connecting Indian companies with state and local economic development organizations across the United States.